The Mugen CF-48 wheel is not a particularly rare design. You can pretty much always find a set for sale. It’s not necessarily the prettiest wheel, either, more function than form. Yet this wheel has risen to near-legendary status in the Honda community on a wave of vintage JDM cool that you just can’t get from anything being produced today. Both the pictures above and below are of the same style of wheel, though the above photograph has the wheel air guides still installed. Most sets of Mugen wheels lost their covers years ago, but I prefer the smooth look they provide. The pseudo motorsport vibe of this wheel style is all it takes to earn the love of many fervent vintage Honda enthusiasts. With the wheelcovers installed, the weird heatsink-style wheel is supposed to move air from the inside of the wheel to the outside, allegedly drawing heat away from the wheel hub. Whether they actually function in that role is largely unimportant. 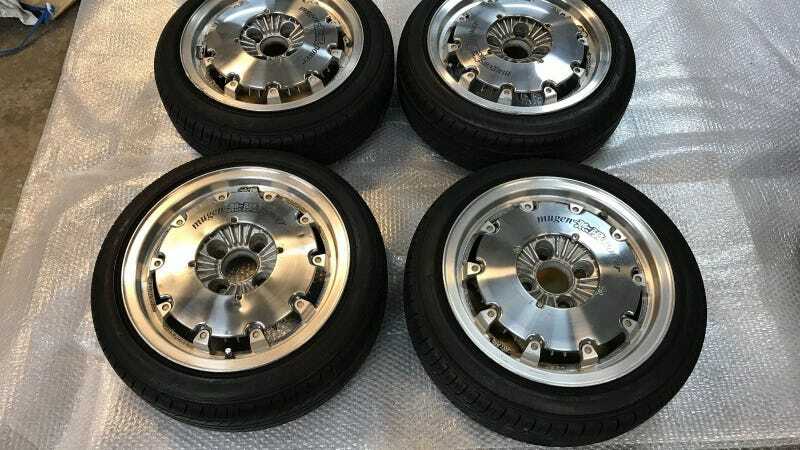 Because this wheel only came in 4x100 bolt pattern and small sizes - 13" and 14" primarily, though 15" wheels are occasionally available - they look best on smaller Honda models of the 1980s and early 1990s. These are a perfect fit for any enthusiast build Civic, CRX, third-generation Accord, or pop-up headlight Integra. The Mugen brand is closely associated with Honda tuning, so it’s no surprise that they’ve built a wheel Honda owners adore. The strange angularity of these wheels works well with Honda’s slab-sides and sharp lines of the era. This post on Instagram further illustrates the wheels with and without covers. While it’s supposed to look like the car is reflected in a pond, it’s actually two different photos stitched together. You can see the wheels with covers in the above shot, and the wheels without covers in the “reflection” section. It’s composed well, but what caught my eye was the gorgeous teal “EF” 4th generation Civic Si hatchback. Very Radwood. The above sets of wheels are available for sale on eBay. The set with wheel covers can be seen here, and for the set without covers click here.